When the cold war ended, many Americans believed the nuclear dilemma had ended with it. Instead, the bomb has moved to the dead center of foreign policy and even domestic scandal. From missing WMDs to the outing of CIA agent Valerie Plame, nuclear matters are back on the front page. In this provocative book, Jonathan Schell argues that a revolution in nuclear affairs has occurred under the watch of the Bush administration, including a historic embrace of a first-strike policy to combat proliferation. The administration has also encouraged a nuclear renaissance at home, with the development of new generations of such weaponry. Far from curbing nuclear buildup, Schell contends, our radical policy has provoked proliferation in Iran, North Korea, and elsewhere; exacerbated global trafficking in nuclear weapons; and taken the world into an era of unchecked nuclear terror. 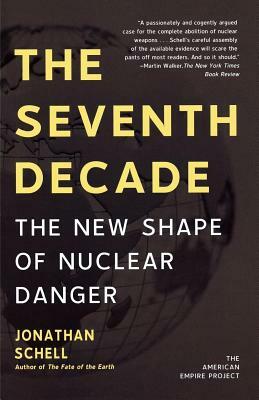 Incisive and passionately argued, The Seventh Decade offers essential insight into what may prove the most volatile decade of the nuclear age. Jonathan Schell, author of The Unconquerable World and The Fate of the Earth among many other titles, is the Nation Institute’s Harold Willens Peace Fellow. His “Letter from Ground Zero” column appears in The Nation regularly. He also writes for Harper’s, The Atlantic Monthly, Foreign Affairs, and Tomdispatch.com. He is a distinguished visiting fellow at the Yale Center for the Study of Globalization.